Life’s easy. Simply load your TX-3000MFP with two media rolls then sit back and let it manage jobs as they come through, switching media accordingly. Your printer’s economical ink produces crisp clear results, on coated and uncoated stock, that won’t run or fade, even when you’re working on site. With a wide range of tools at your fingertips, including a cost calculator, you can customise operations and manage processes to optimise efficiency. 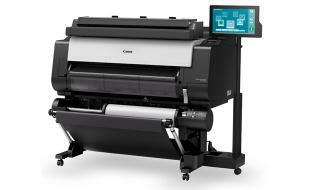 Interested in the Canon iPF TX 3000 MFP?